This lightweight yet appealing Butterfly emphasizes the youthfulness of its characters, and all the vulnerability, passion and folly implied therein, by casting unusually light lyric voices in the principle roles – chiefly by casting Anna Moffo, lyric coloratura extraordinaire, as the usually spinto-voiced heroine. At age 25 and at the beginning of her career, she sings with a sweetness, purity, delicacy and freshness of tone unmatched by other Butterflies, yet ideal for the character of the naïve 15-year-old, and still with enough dusky vocal color to make her singing truly lyrical, not soubrettish. Furthermore, her characterization brims with youthful tenderness and ardor, with (for better or for worse) a profusion of girlish laughter and sobs. Her manner may be a bit too lively and, even at this early stage, her timbre too sensual for Puccini’s shy little geisha, but the overall beauty and poignancy of her Cio-Cio-San can’t be denied. Cesare Valletti is a slightly mixed blessing of a Pinkerton, sharing Moffo’s lightness of voice but without the same tonal warmth or sweetness. That said, he offers an effective portrayal of a charming yet reckless young officer, perfectly capturing both the breezy amusement of the first act and the anguish of the last. Rosalind Elias, meanwhile, is an involved Suzuki with a smooth, rich sound, though her passion sometimes borders on hysteria. Renato Cesari is a slightly gruff-toned Sharpless, but a dramatically vivid one who offers wonderfully soft, sad singing in the Act III trio. Mario Carlin is a solid, colorful Goro, the minor roles are all well filled (with a luxuriously cast Fernando Corena standing out as the Bonze), and the chorus is effective, though slightly rough sounding, typical of ‘50s recordings. Erich Leinsdorf conducts with a brisk, adept hand – his interpretation lacks the sheer romantic lushness and tenderness of others, but on the positive side it conveys feeling without any overdone sentimentality or melodrama. 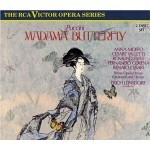 While neither perfect nor the only good Butterfly available, this recording is still a Butterfly to treasure. I recommend it to any Puccini lover.